Built at the site of a former Indian Village, Bear Cave Resort has a rich historical tradition. 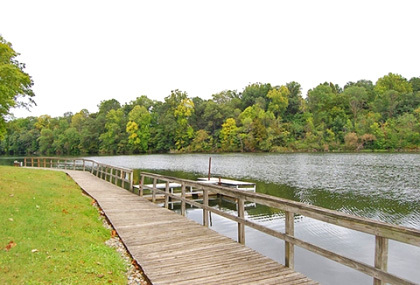 The resort is located on the St. Joseph River and is popular with anglers. Golf, handball, ice skating, miniature golf, mini-bike and go-cart track, racquetball, tennis, Notre Dame University at South Bend, Indiana (35 mi), Lake Michigan (20 mi), Warren Dunes State Park, on the shore of the lake, is also accessible. Tabor Hill Winery and many historic attractions nearby. Detroit is 4 hours away. Bathhouse, boat dock, ramp, canoe and paddle boat rentals, clubhouse, game room, general store, hot tub, laundry facilities, park, picnic area, pavilion, play field and playground, river, swimming pool, TV lounge, basketball, boating, fishing, horseshoes, shuffleboard, volleyball. Reservations required for RV sites and may be made up to 90 days in advance through RPI's Central Reservations Office. Reservations for rentals required and must be made up to 30 days in advance directly with resort. 2-night minimum stay for rentals. -A $10 deposit is required for RV reservations. -Proof of insurance and registration for your unit may be required at check in. -Day guests are allowed for $5 per person. -Cave Tours are available for $3 per adult and $1.50 for children. Must cancel at least 48-hours prior to avoid $25 cancellation fee. From Chicago, take I-94 to 12, go east on US 12 for approx 28 miles to Red Bud Trail. Turn left (north) on Red Bud Trail and proceed about 6 miles to the resort sign, which is on the right. From Detroit go approx 10 miles to Exit 13 (Snow Road). Turn Right (not left) to 1st stop sign (Red Bud Trail). GPS: 41.882066, -86.357324. Get directions from Google Maps.